Bob and Norma Clark were married on August 29, 1964. Yes, they had a beautiful wedding in a church, complete with all the trimmings. But no, their marriage never got recorded with the County Clerk in San Mateo County, California, where their wedding took place. However, they didn’t discover that until forty-eight years later. It turns out that they had never been legally married. So were they married or not? That depends on your definition of marriage. As far as the courts, the State of California, and the U.S. government were concerned, they were not married. They discovered that they had never been legally married when they began working on their wills and making legal arrangements for their deaths. They requested their marriage certificate from San Mateo County in order to ensure that they could receive one another’s Social Security benefits in the event that one of them died before the other. But there was no record of their marriage on file. Although they had been married for forty-eight years, they were not entitled to any of the rights and benefits that married couples enjoy under the law. 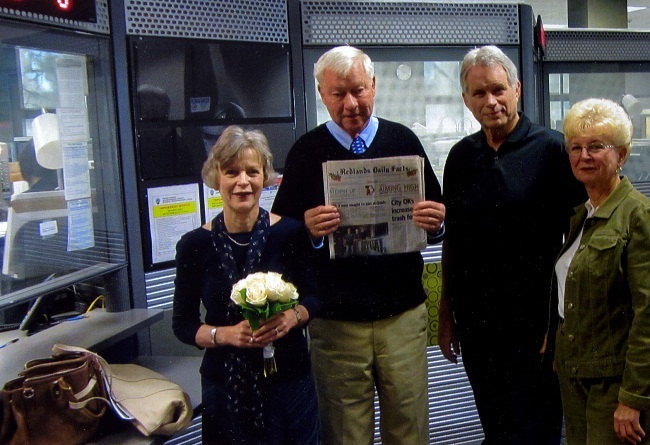 So nearly five decades after their wedding, they made arrangements to get the marriage license filed and make it legal. Does this mean that during all those forty-eight years when they lived together as husband and wife, loved one another, took care of one another, raised children, and experienced the joys and the challenges of married life, they were not really married at all? Bob and Norma Clark had a real marriage, regardless of the legal status of their marriage. Real marriage is not merely a legal contract with the state. It is a spiritual relationship. And by “spiritual” I do not mean wispy and ethereal. I mean a real union of two hearts, minds, and lives into one. This includes a commitment not only to each other, but to the union itself—to do what is necessary to protect and foster it. Real marriage comes to exist when two people find a oneness of spirit with one another, and declare their commitment to that oneness before God in the presence of their family and friends in a wedding ceremony. Real marriage is an inner oneness of two people that is recognized by the community and blessed by God. If two people also desire a contract with the state giving them certain legal rights and privileges as a married couple, there is no problem with that. Those rights are valuable. Nothing in this post is meant to minimize the importance of legal marriage and its advantages to committed couples who wish to function as couples in the social, financial, and legal systems of society. We believe that those civil rights should be available to any and every adult couple that wants to take advantage of them. But let’s not confuse legal marriage with real marriage. I got her a nice bouquet, and it was just a hoot. There were about 35 people there who were asking us why we were there. We told them that we’ve been married, and we brought along a book of all our pictures and showed them off. ‹ Nations are People, My Friend! If you have a spiritual ceremony without making it legal can the woman still take your last name? I’m not a lawyer, but I suspect that in most countries there are legal processes for people to change their name if they so desire. It might be easier in some countries than in others. Of course, if one spouse did legally change last names to match the other spouse’s name, it would not cause the marriage to be recognized as a legal marriage. People can informally go by any name they want to. But without a legal name change, it would be necessary to go by the legal name on any official documents and in any legal proceedings. I am a mother of 3, currently in an “unmarried” (uncertified) relationship with my spouse now for over 25 years. For the first 10 years of our relationship, I deeply desired a wedding. I wanted our relationship legal. As time went on, I simply gave up on that idea. He considers me his wife, likewise, I consider him my husband. Though he believes in God, he is not devoted. So I sought the advice of an elder of our church. After revealing my concerns, I was told, I should leave him? That I was living in fornication. It bothered me. For weeks. My heart told me otherwise. So I called him (the church elder) and asked, “In scripture, what does God consecrated as marriage?” He quoted a scriptures the law of Moses. And writings of Paul. Basically, A ceremony and/Or governing authority. I then argued (Not in disrespect) then what method did God use for Adam and Eve? We debated for awhile without resolve. As soon as I hung up the phone, I heard the Lord say, “Niether were you wrong nor were you right. Niether was he wrong nor was he right. For God accepts all three. But God is Spirit and the law of spirit stands. “BE fruitful and multiply.” “What God brings together, let NO MAN TEAR APART.” “For the mind set on the flesh is death, but the mind set on the Spirit is life and peace, because the mind set on the flesh is hostile toward God; for it does not subject itself to the law of God”. The spiritual fruits are love, peace, mercy, truth, faith….” then I heard for God accepts ALL THREE! Thanks for stopping by and telling your story. As I mention in the article, legal marriage is a contract with the state giving the couple various rights and privileges that can be quite useful in this world. Any couple that wants those rights and privileges should certainly take advantage of them if there aren’t obstacles making it impractical or impossible. However, as I also say in the article, real marriage is not a legal contract, but a oneness of minds and hearts. If you have that with your husband, then I believe you are married in the eyes of God regardless of whether you choose to enter into the contract of legal marriage. Having said that, I do think that having a wedding ceremony with friends and family in attendance, ideally involving a blessing of God on the marriage, is a good thing. It makes the community a part and supporter of your marriage. Many people simply won’t recognize two people as married if there has been no legal or ceremonial wedding. Still, a ceremony is not the key component of a marriage. Rather, the key to a marriage is the oneness of hearts and minds that I mentioned. And in fact, there is very little mention of wedding ceremonies in the Bible. If a wedding ceremony had been a very important thing spiritually, the Bible would have commanded it, or at least given some sort of instructions for weddings. But there are only a few mentions of weddings in the Bible, none of them with any instructions attached. It seems that especially in earlier Old Testament times, marriages were simply recognized by the family and the community without any particular ceremony or contract. Later weddings seem to have become a cultural practice, and weddings are mentioned in the Psalms and the Gospels. That’s a long way of saying that contrary to what your church elder said, I do not think you should leave your “common law” husband. If the two of you have been together for twenty-five years and have a good and stable relationship that looks like it will last at least “until death do us part,” why break it up over the lack of a ceremony that is not even commanded in the Bible? Thanks for your articles. I just want to know if family and friends must witness ones marriage before it becomes real. Can it just be a declaring of committment to each other in a marriage relationship in our privacy in the presence of God (but not necessarily in church) without or with the witness of family and friends? That’s a personal decision that couples must make for themselves. Having said that, consider that marriage is not only between two people. It is also a relationship recognized among family, friends, and community. And especially when the going gets rough in the marriage (as it will), having social recognition and support of the relationship can be a great help in avoiding an inward spiral and explosion that can rip a marriage apart. Having family and friends present at the ceremony helps to establish among them, and in society generally, a sense of participation in the relationship that is hard to establish if it was only a private commitment between the two people. That’s why, though a private commitment is of course an option and a personal choice, I generally recommend that couples have at least their closest family and friends present for a simple wedding ceremony even if they don’t want to have a big, fancy church wedding with all the bells and whistles.